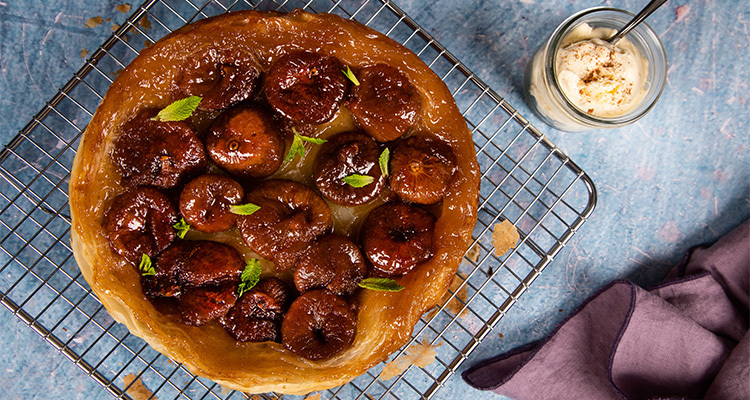 This week, we’re learning how to make a cinnamon poached fig tart tatin. Preheat the oven to 200oC, gas mark 6. Base line a 22cm round cake tin with baking parchment. Place the jam in a medium saucepan with 3 tbsp water, agave syrup and cinnamon, add the figs and simmer for 2-3 minutes. Pour into the prepared cake tin. Roll out the pastry on a lightly floured surface to give a 24cm circle, place over the figs, tucking the edges of the pastry inside the tin. Bake for 25-30 minutes until golden. Upturn onto a serving plate. Great served warm with vanilla ice cream or cream. Try using ginger or mixed spice instead of cinnamon.